Good morning! Did you watch Brother vs. Brother on HGTV last night? I didn't get it. I thought the idea was that the two teams were suppose to make changes that would increase the value of the homes they were working on. But the contestants that were put on the chopping block were the ones who were installing hardwood floors and renovating the kitchen. The contestants who were safe from elimination "added value" by pouring paint on a canvas and glueing and torching wood on a wall above the fireplace. I didn't bother to stay up to watch the rest. custom pillows in Magnolia "Gootar" and Diamante "Flax"
recovered vintage Louis chair in Magnolia "Defoe Ice"
maybe eventually add some drapes, but for now, I'd say this room is DONE! 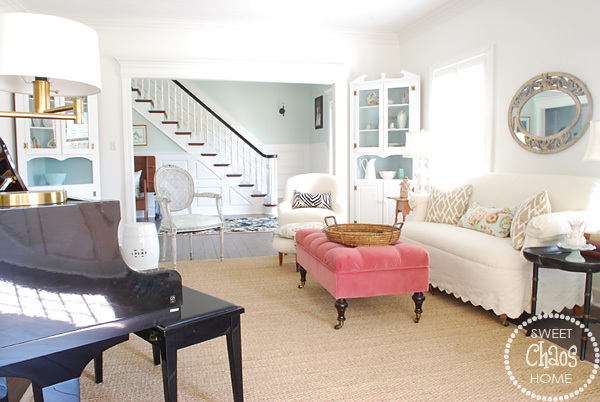 If you missed the first room on the house tour, check it out here. I love your living room....classic with a slightly modern feel! Just perfect! Your living room is stunning! I love the soft colors and the overall classic feel! Nice job, Carolyn! OMG this is seriously your living room? I love it, it's so pretty and clean looking. I really like everything about and I dont say that often. Stunning. Thanks for sharing! Beautiful! 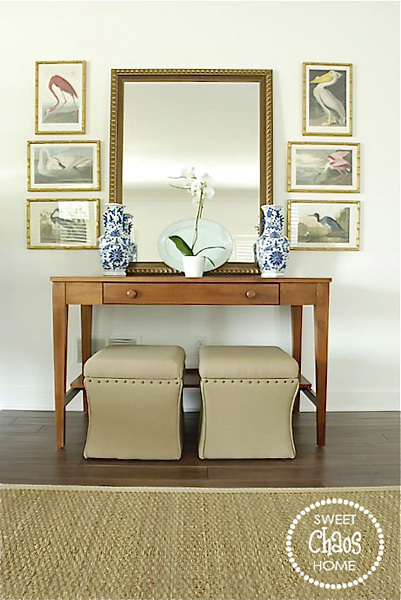 Love the pop of color with the ottoman. The hardwoods .. once you have them you want to remove ALL carpeting! The blue and white is gorgeous with the wood. I always love seeing this room. Just gorgeous. I really love this room Carolyn. 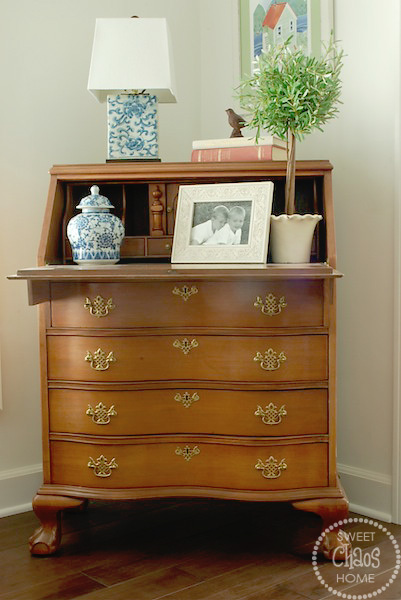 It's so pretty, just the right amount of formal, but warm and inviting too. You're making me want white walls . 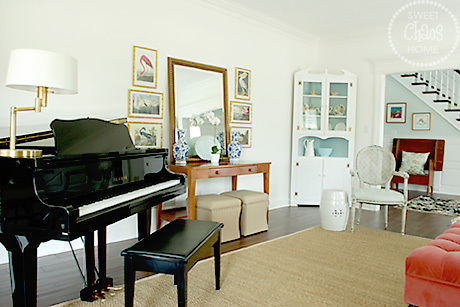 . .
Carolyn love love love this space!! 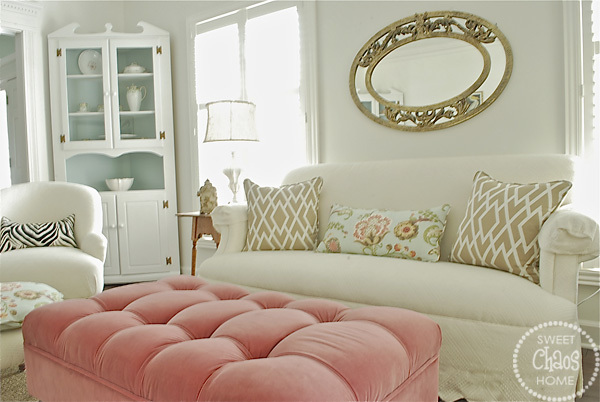 this is my favorite room in your home- i love the color and the playful feminine pop of pink! Just beautiful! I especially love the pop of pink/coral. Your living room is simply beautiful! I wish I could cozy up on your sofa with a cup of tea! Gorgeous! I truly am loving that raspberry ottoman. Especially all the tufting! A beautiful room. It is a lovely room ! What a beautiful room! 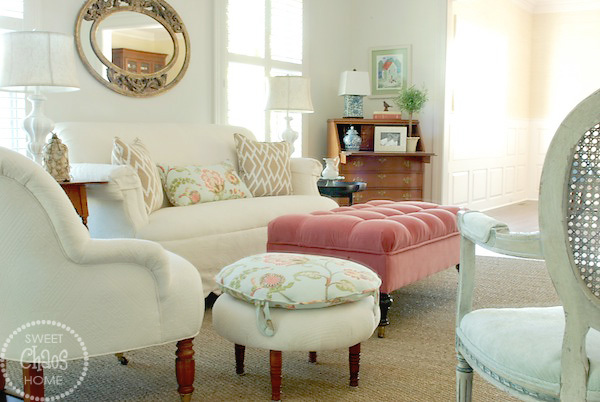 I absolutely adore your pink ottoman! Did you upholster it yourself? or did they do it at Ballard Designs? Just love it. Beautifully done. Sorry I just commented using my husband's gmail account (dfrei). If you could delete that. I absolutely love this room! 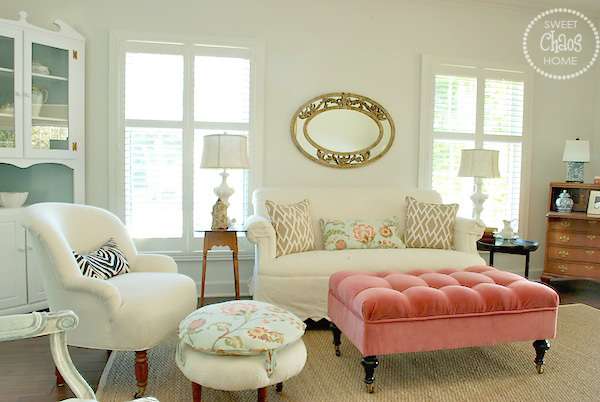 I especially love the ottoman and the color are gorgeous. I love it!